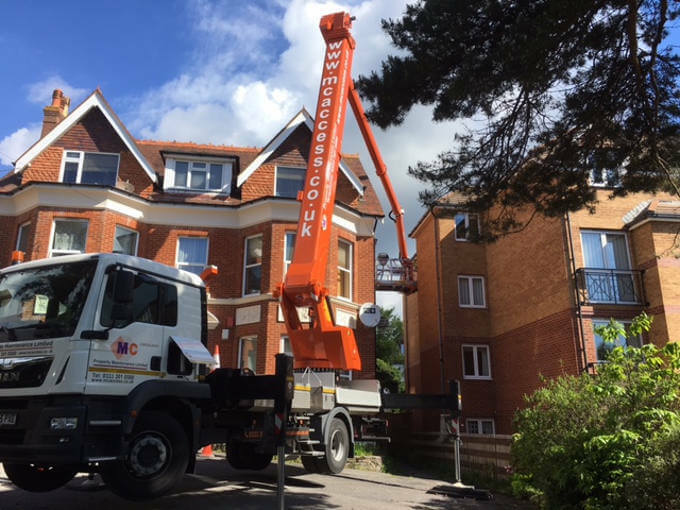 Whether you need to clean windows, fix a roof, repair gutters or trim trees, cherry pickers are a safe and cost-effective way to reach awkward, high-up areas. Used widely by commercial builders and maintenance personnel, access platforms are also useful for homeowners installing high-level decorations, or taking aerial photography at events. 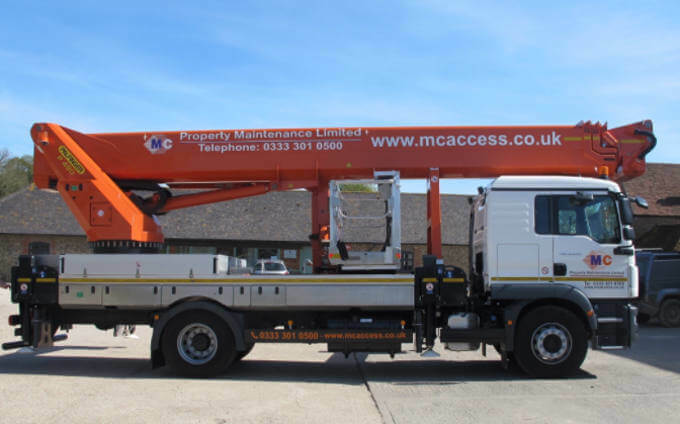 There are a surprising number of factors to consider when choosing the right cherry picker to hire. We’ve put together this guide to help navigate you through the questions you should be asking yourself, to ensure you can carry out your work safely, whatever it may be. The most obvious factor to consider is how far you need your cherry picker to reach. This includes both the vertical height from the ground, but the horizontal stretch you will want to achieve while you’re at height. Be aware that cherry pickers will be measured from the ground, and usually include the height of an average person (so do not add your own height onto the measurements provided in the specifications). Similarly, sideways reach will include the length of an outstretched arm, so consider the weight of the tools you will be using and what your comfortable reach will actually be. Look for the “safe working load” of a cherry picker, and compare this to the weight you intend to take into the bucket with you as you work. As well as your own weight, don’t forget to include any tools and equipment you intend to use for the job – work belts and tins of paint can quickly amount to a considerable load, and the weight in the cherry picker bucket will directly affect how high it will safely reach. Can you legally operate the cherry picker? In most cases a standard car driving license will be sufficient, as it permits you to operate machinery up to 3.5 tons. If they cherry picker you need is heavier than this (up to 7.5 tons), you may only operate it if your driving license was issues before 1994. If you license was issues after this, or you require a more specialist cherry picker, you will need to hire a licensed operator, or complete further training. If you are at all uncertain about using a cherry picker, we are happy to provide an experienced and qualified operator to perform high-level painting, cleaning and repairs as required.Contact us today if you need any assistance with high-level work. Is your job inside or outside? If you’re hiring a cherry picker for indoor work, the first step is determining whether the space has enough ventilation to safely house a diesel vehicle. It’s more likely that an electric vehicle will be appropriate, helping you narrow down your machinery options. Once deciding the best fuel type, measure the width of the narrowest gaps the machinery will need to pass through to gain site access. Also make a note of the turning radius to check how much you will be able to manoeuvre the cherry picker once it’s on-site. The best cherry picker for outdoor work will depend on the condition of your ground. Sloped terrain will require machinery with the appropriate gradient stability (listed in the product specifications), whereas a model with outriggers is better for areas with excessive ground water. Be aware of any overhead obstructions, like power lines or street lights, too. If you have any concerns about the condition of your ground being able to support a cherry picker, we recommend calling us on 01243 530076 for advice. The price of cherry picker hire is generally scaled according to the size and reach of each machine. Unfortunately, this makes it tempting for people to underestimate the requirements of their job, and rent a machine that doesn’t get quite high enough, or won’t safely support the weight of all the tools in the basket. This results in people having to compensate, and take serious safety risks to complete the job. Taking the time to properly measure the scale of a job will ensure you don’t waste money on a cherry picker which is too big, while keeping everybody on site working safely.